This episode of The Productivityist Podcast is sponsored by Health IQ, an insurance company that helps health conscious people like runners, cyclist, weightlifters and vegetarians get lower rates on their life insurance. Go to healthiq.com/vardy to support the show and see if you qualify. 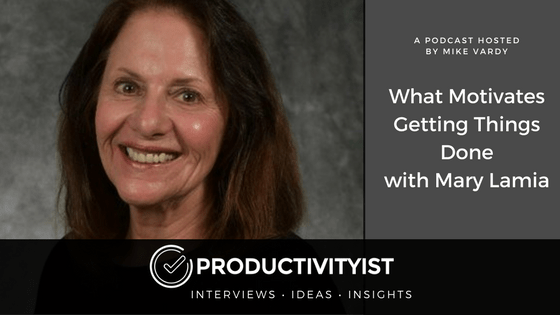 Today’s guest is Dr. Mary Lamia – a clinical psychologist, psychoanalyst and the author of the new book What Motivates Getting Things Done. If you’re interested in supporting the podcast and receiving exclusive content while doing so, you’ll want to check out the patrons-only version of The Productivityist Podcast on Patreon. Also, remember to leave The Productivityist Podcast a rating and review on iTunes, or on whatever platform you’re listening to. I read every single bit of feedback we receive. I want to make this show better and with your help I can do that. If you’d just like to support the podcast on its own, you can do so here.